The Ultimate Fighting Championship returns to Chicago, IL with UFC 238 held at United Center on June 9 (AEDT). Women’s Strawweight battle between Felice Herrig and Xiaonan Yan is in the works for the fight card, Combate reported on Tuesday (AEDT) citing sources close to the promotion. As understood, the contracts are yet to be signed. Nevertheless, the bout is expected to be formalized shortly. 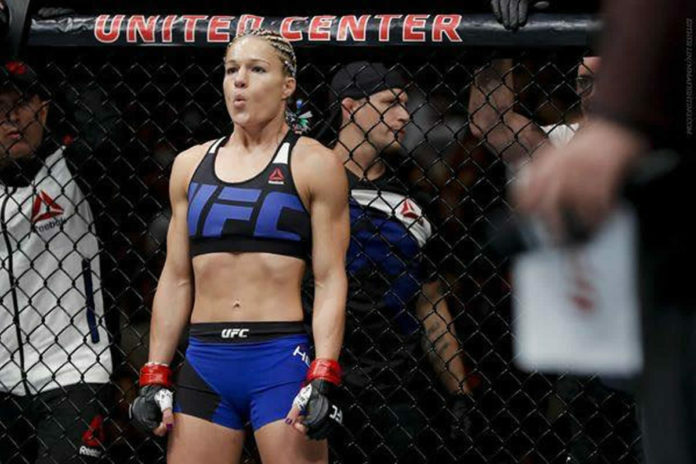 In her previous bout last October Felice Herrig (14-8) suffered a defeat against Michelle Waterson, who earned a unanimous decision at UFC 229: Khabib vs. McGregor. Before that she was defeated by Karolina Kowalkiewicz who took a split decision in April 2018, which snapped her four-fight win-streak including victories against Courtney Casey, Justin Kish, among others. Xiaonan Yan (10-1, 1NC) is riding a three-fight undefeated streak in the UFC. She made her debut in November 2017 scoring a unanimous decision against Kailin Curran. Two of her previous bouts she also won by a unanimous decision coming out victorious over Syuri Kondo and Viviane Pereira. Topping up the bill, the reigning UFC Flyweight champion Henry Cejudo said that a fight against Marlon Moraes for a vacant bantamweight belt is in the works for the upcoming show, ESPN reported on Tuesday (AEDT). T.J. Dillashaw has recently relinquished the title after “adverse finding” in drug test before his fight against Cejudo in Brooklyn early this year. In addition, Australian heavyweight Tai Tuivasa has recently confirmed his outing at UFC 238. Stepping inside the Octagon in Chicago he faces Blagoy Ivanov of Bulgaria. Among the bouts featured on the card Valentina Shevchenko defends UFC Women’s Flyweight title against Jessica Eye. The expected list of bouts can be found below.